Cherokee Purple heirloom tomatoes are rather odd-looking tomatoes with a flattened, globe-like shape and pinkish-red skin and hints of green and purple. The flesh is a rich red color and the flavor is delicious – both sweet and tart. 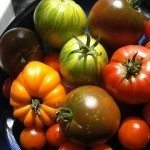 Interested in growing Cherokee Purple tomatoes? Read on to learn more. Cherokee Purple tomato plants are heirloom plants, which means they have been around for several generations. Unlike hybrid varieties, heirloom vegetables are open-pollinated so the seeds will produce tomatoes nearly identical to their parents. These tomatoes originated in Tennessee. According to plant lore, Cherokee Purple heirloom tomatoes may have been passed down from the Cherokee tribe. 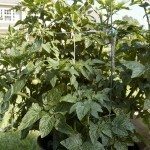 Cherokee Purple tomato plants are indeterminate, which means the plants will continue to grow and produce tomatoes until the first frost in autumn. Like most tomatoes, Cherokee Purple tomatoes grow in nearly any climate that provides plenty of sunlight and three to four months of warm, dry weather. Soil should be rich and well drained. Dig in a generous amount of compost or well-rotted manure before planting. Planting is also the time to use a slow-release fertilizer. 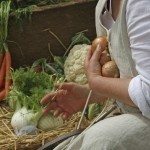 Thereafter, feed the plants once every month throughout the growing season. Allow 18 to 36 inches (45-90 cm.) between each tomato plant. If necessary, protect young Cherokee Purple tomato plants with a frost blanket if nights are chilly. You should also stake the tomato plants or provide some type of sturdy support. Water the tomato plants whenever the top 1 to 2 inches (2.5-5 cm.) of soil feels dry to the touch. Never allow the soil to become either too soggy or too dry. Uneven moisture levels can cause cracked fruit or blossom end rot. A thin layer of mulch will help keep the soil evenly moist and cool.